Download your guide to praying the Rosary now. The Rosary is one of the most powerful, most comforting prayer rituals of the Catholic faith — a never-failing lifeline. Whether you are “stumbling” on the holy Rosary for the first time, or you have been a friend of the Rosary for many years, Your Rosary Booklet will assist you in praying the Rosary. With each meditation focusing on one major truth or event in salvation history, Your Rosary Booklet is intended as a refresher course in Christian doctrine. Fill out the information below to download Your Rosary Booklet. 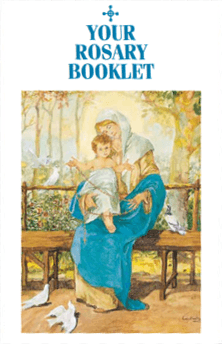 And, the booklet is more than just a guide to praying the 20 Rosary mysteries — it also includes a message from the Virgin Mary for each mystery, suggested readings, and more.